This board is available through our dealers as deck only or complete with components from leading manufacturers such as Randal, Holey and ABEC 11. More pictures will be added in March 2009! Lastly – a list of your dealers would be a nice feature to this website. Estimated date of availability is mid April. Deck only price is not available yet, but should be below SEK 900 including griptape. Thank you for the feedback, we hope to have a dealer list available on this website in April! Well i think that this board is really innovated and that the style of it is very cool. I like the fact that you guys have the drop in trucks so that it can be good for down hill purposes since both ends of the boards curve in you really can get low to the ground on sharp turns. This board looks very similar to “loaded” boards which i really enjoy but i feel as this may be somthing new to try in the long run i will be checking out your products and probably will invest on buying this board. Is it hard to do manuals with dropped trucks? Will you make any vids of it? Yes, it is a little bit harder than usual to do manuals with dropped trucks due to having less leverage, but it is by no means impossible! We are not planning on making any videos on this model (or any other) at the time, but we will take this suggestion into careful consideration! Thanks! By any chance “inspired” by Mr. William Yowell´s Kracked Skulls M1 board? The resemblance is actually quite striking. To be totally honest, The Twin is exactly the same board as “The Lowrider”, which was developed in 2006 (that shape being slightly inspired by a board from Kebbek). We love the graphics as well – everyone has their own interpretation of what they really mean! Is it possible to get it without griptape? But it is really easy to remove it using nothing more than a sharp blade and some tugging. Hi! I’m looking for a downhill board. But I have a specific request; without cutting down on the high speed abilities I still want to be able to cruise (read: ride to school) with it. What board do you suggest? This one looks quite cool eventhough I like the Lowrider’s graphic better. The Supercrusher is interesting too but I’m not convinced it will meet my demands on downhill preformance. I also wanted to add: nice website! And I’m amazed that you guys take the time to answer all questions :) I have never had the pleasure of encountering such a friendly company before! 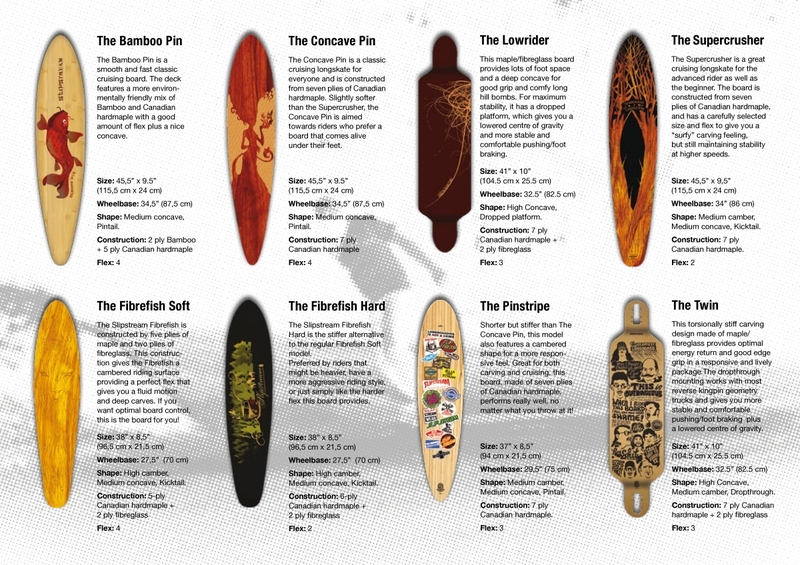 There are no “true” downhill boards in our lineup but we make a lot of sweet rides for carving and cruising! That being said, downhill is a lot about skills and not so much about equipment as one might like to think. As an example, we have learned that a well known Swedish rider finished on a solid 4:th place at the Downhill competition “Gold Coast Outlaw” in Australia a couple of weeks ago riding his 2008 Lowrider. As far as recommendations go, both “The Twin” and “The Lowrider” are pretty solid choices if you like to go fast. 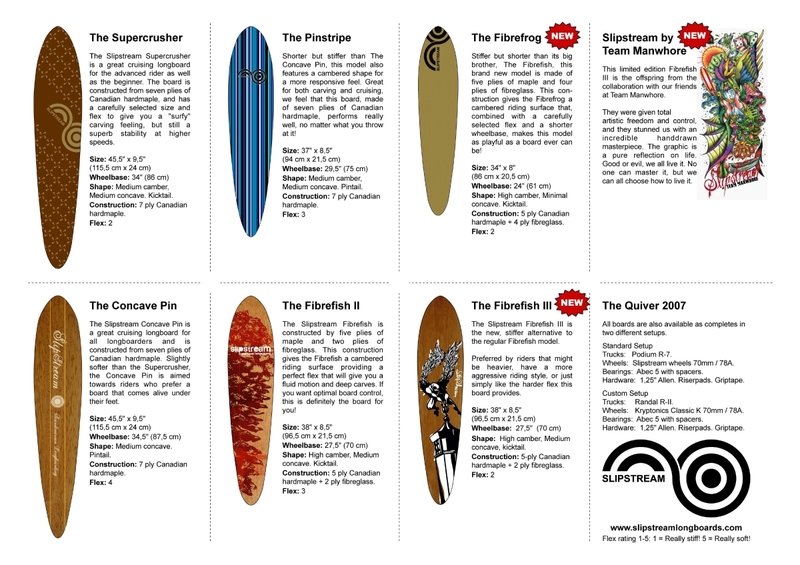 Your friendly neighbourhood longboard company – thats us! Ah man! You shouldn’t have said that thing about your boards not beeing downhill boards! I mean I appreciate that you are honest but now I’m all confused! Currently I own a Sector 9 City Crusher which is great for cruising where I live and around school. Down steep hills, though, it’s lethal. So now I’m thinking it would be good to have another board that is the total opposite of my city crusher (i.e a stable downhill board), but as I said. I still want to BE ABLE to navigate through Gothenburgh city with it. riktigt riktigt bra bräda. inköpt på skank i uppsala. har både lowrider och twin. twin är stabil! I asked the same question about another board earlier so I´ll ask the same here..
Is there a maximum wheight to use this board? I am like 95 kilograms or 210lb, am I too heavy? I want a board that is not too flexy because I am heavy, 95kg at least. 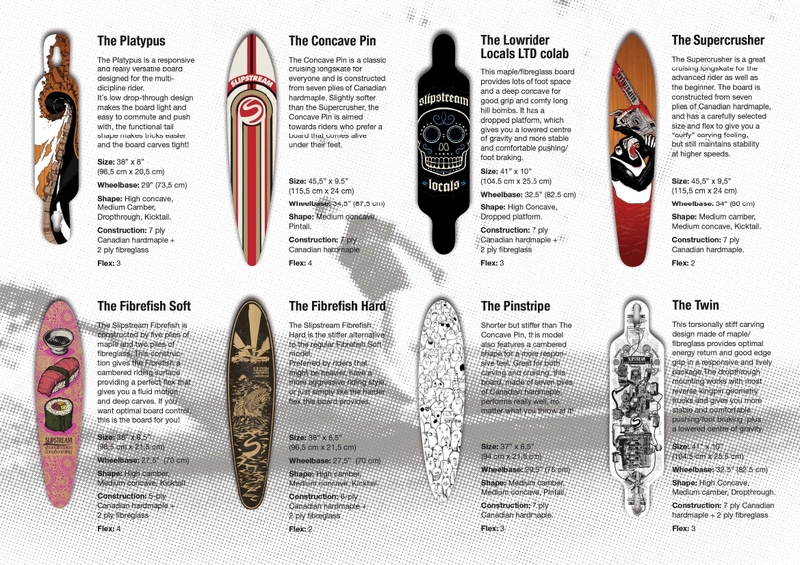 This board will hold up for you perfectly as a carver/cruiser. I would actually prefer to recommend this model to you since the Pinstripe is slightly softer. Passar twin att trixa med? som mitt förgående inlägg där jag skrev vad jag var ute efter, crusing osv. Regarding the bolts, it is a good suggestion to mount them the other way around with the nuts under the deck, but both ways work and it is no problem to stand on them – nothing will break! This is a really fun ride! Tricks like manuals are pretty difficult at first, but practice makes perfect and we have witnessed some pretty sick moves from skilled riders on this baby! what wheel is it on “the twin” ? and what trucks? Pictured you can see The Twin with Paris Trucks and Retro BigZig wheels. This board is available through our dealers equipped with a wide selection of wheels and trucks from leading manufacturers such as Randal, Paris, ABEC 11 and Retro. ETT TIPS! fixa brickor (såna små “mynt” med ett hål i som man trär skruven genom) så att inte skruven äter sig in i brädan eller tom spräcker den. Jag har köpt ett par 180 mm Paris truckar och Orangatang Durian Freeride 70 mm 83a hjul. Önksar nästan ett par 75 mm så att man kommer upp lite i hastighet… Brädam gick på sammanlagt 2700 kr. Annars är den riktigt skön bräda med mycket kontroll och frihet. Gick tillbaka till min lite mindre citycruiser-bräda och märkte direkt hur grym the twin är. What is the max.weight on the twin-board? Riders weighing in at up to 110 kgs are currently having lots of fun on this board. We have not set an upper weight limit on this board yet, but if you weigh in at 120 kgs+ you might want to consider other options in my humble opinion. Happy midsummer to you as well! Sick board! I love it. So stabel for the big hills and high speed stand up slides. Thanks for the message Gustav! This was the first edition of The Twin and we had 0% of the boards snapping (as far as we know from warranty claims). Cosmetic stress fractures from the trucks appeared on occasions on bottom of deck when washers were not used. Same thing on top of deck when rubber shockpads were absent.